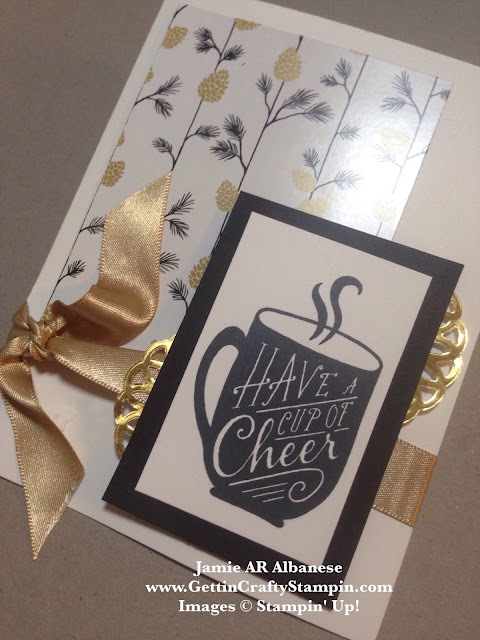 I'm sending you a cup of cheer on this National Coffee Day! 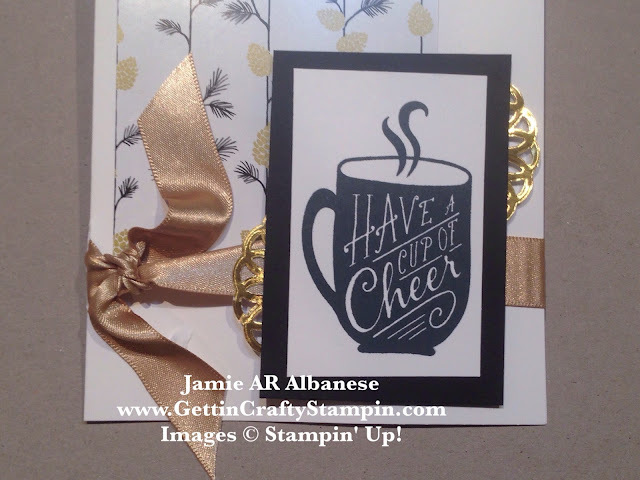 Using the new Cup of Cheer stamp set to create this golden hand-stamped card. 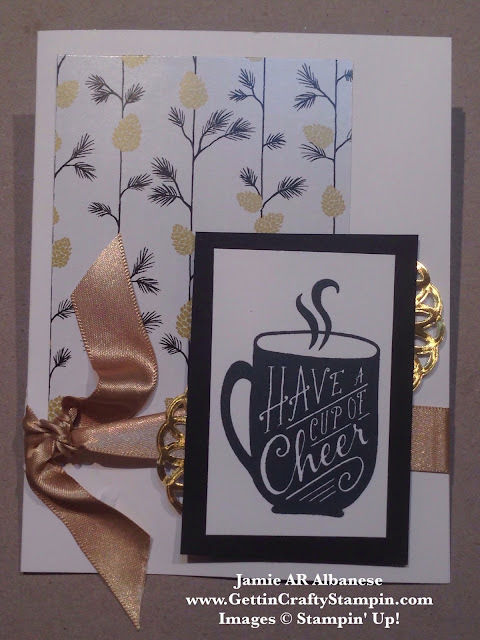 Create and connect with me at fun coffee, cards and connecting on Monday Mornings at Ragamuffin Roasters and at my home studio classes with our fun coffee bar! With the Fall Season, it's fun to incorporate this new Winter Wonderland Specialty Designer Series Paper. With a pretty high shine and gold accents in pine cones it's perfect for this season. Accented with the Gold Doilies from the Metallic Foil Doily collection and the Gold Satin Ribbon. Create a seamless look when you slit the score line and thread the ribbon through. It will allow for a rich wrapped look. It's extra rich.. just like a good cup of coffee. Stamping this cute cup is a sure fire way to deliver warmth and smiles. The Archival Black Ink Pad is simply wonderful. Crisp hand-stamped images are easy to create. Stamped on Whisper White card stock and framed with a Basic Black card stock for a sharp look. You can't exactly send a cup of coffee in the mail. Giving a fun card like this (which is ideal for a gift card if you feel inclined) is a great way to deliver some warm smiles. With rich accents of gold, sharp black and white.. it is on-trend and an elegant hand-stamped card. 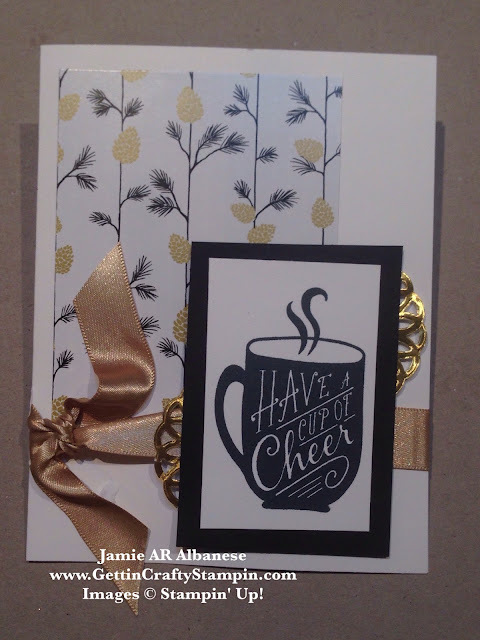 Join me in sending cheer into the world, wrapped up in a pretty hand-crafted card.